This past July, we invited our entire team and their spouses to Barre, Vermont – the Granite Capital of the World – for a 3-day visit to Rock of Ages. 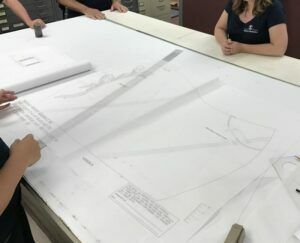 As the area’s only Rock of Ages dealer, we wanted our team to learn from their experienced craftsmen and better understand what makes Rock of Ages the gold standard in the monument industry. Here what our team thought of our trip to Rock of Ages in Barre, VT. The tour involved every aspect of Rock of Ages’ quarry and manufacturing facility. Our team experienced phenomenal views of the quarry, where they mine for Barre Gray granite. They saw the massive machinery that can lift and transport these multi-ton slabs of granite. In the manufacturing facility, Rock of Ages illustrated how slabs are cut down to individual memorials, then shaped and polished to perfection before being shipped out to monument companies across the country. No tour to Barre, VT is complete without a visit to Hope Cemetery, known for its unique monuments made by the world’s greatest stone artisans. Over 10,000 monuments and grave markers are in this cemetery and all are made from Barre Gray granite, Rock of Ages’ most popular granite color. These monuments feature intricate carvings and one-of-a-kind shapes, including a soccer ball, a racecar, a bed, and a living room chair. In addition to the expert craftsmanship, our team saw first-hand how durable Rock of Ages’ premium Barre Gray granite is in this 122-year-old cemetery. As is evident at Hope Cemetery, Rock of Ages Premium gray granite does not crack, fade, or wash out, which can happen to other granites over time. Our team of craftsmen, installers, and monument counselors learned a great deal about how the granite is mined, processed, and polished before it gets to us in southcentral PA. Our designers spoke with their design team, picking up ideas and techniques to help us when we make our custom monuments. Our team heard multiple testimonials to Rock of Ages’ signature warranty and how they have replaced entire monuments years after installation because it did not meet the customer’s expectation. From the 8-hour bus ride to the various tours and adventures, we all gained insight into Rock of Ages, learned more about those on our team, and grew as a part of the Weaver Memorials family.